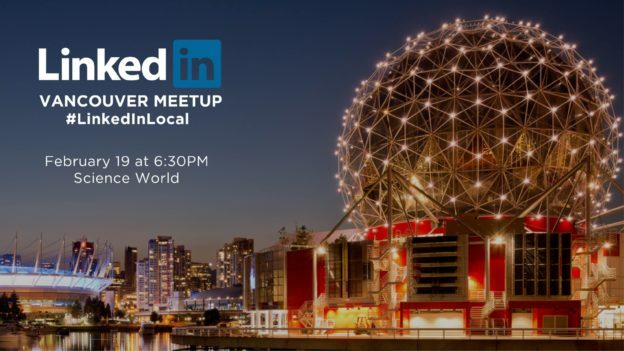 Vancouver’s 2nd LinkedIn Local meet-up is officially happening at Science World on Monday 19th February 6:30pm-10:30pm! If you’ve not heard of a LinkedIn Local before, it’s a movement that has spread like wildfire over the last 9 months with LinkedIn users organising their own get-togethers with the intention of “meeting the person behind the profile”. Now, this movement has reached over 150 cities round the world, including our own Vancouver. At the Science World meet-up, there will be a range of speakers focusing on two key topics: Firstly, “The Role of Failure in Entrepreneurial Success” and secondly, “Ways Blockchain Technology Will Change The World”. A light finger-food buffet is included within the ticket price (currently $10 for the early-bird rate) and there’ll be plenty of opportunity for networking with the other 200 attendees. There’ll even be a series of “Meet The Experts” stations with inspirational leaders to chat with about subjects like branding, making waves in the corporate world and how to hustle on LinkedIn and in business as a student. This entry was posted in Uncategorized and tagged LinkedIn Local on February 6, 2018 by admin.